Rezone Inwood for the 99%, Not Developers! This summer, the New York City Council will vote on a massive rezoning plan for 62 blocks of the northern Manhattan neighborhood of Inwood. If approved, this plan will make matters worse for working class residents and people of color who are already struggling to survive in one of the most appallingly unaffordable housing markets in the country. The city’s plan, put forward by the de Blasio-appointed Economic Development Corporation (EDC)—whose board members and staff are tied to Wall Street, big business, and developers—also shows the limits and failures of de Blasio’s housing agenda for New York City. The EDC plan is part of a broader process of rezoning New York that started with the Republican administrations of Rudy Giuliani and Michael Bloomberg. Working-class neighborhoods have been targeted one at a time as potentially lucrative sites for the development of outlandish luxury projects which were supposedly justified by including some meagre affordable opportunities for lower-income residents. This process has only continued under de Blasio, despite the current administration’s efforts to put a more human face on the otherwise destructive system that continues to drive up rents for everyone while displacing working-class residents and people of color. Indeed, the administration’s proposed solutions to this crisis include a number of measures that at first may seem promising, including “mandatory inclusionary housing,” in which a small percentage of housing is necessarily rent-restricted to roughly 30% of the area median income (around $45,000 for Inwood), and “contextual rezoning” in which some of the neighborhood’s existing character is preserved. In Inwood, the EDC has even included a new community green space, has promised a new library (though community members have been perplexed as to what’s wrong with the current library) above which would be built 100% affordable housing, and have promised to include some resources to help combat potential tenant harassment by predatory landlords. But housing and community activists in Inwood have rightly raised deep concerns about the reach of these measures to adequately fight back against the the interests of developers whose dominance over city planning has in preceding cases led to mass displacement, homelessness, and gentrification. 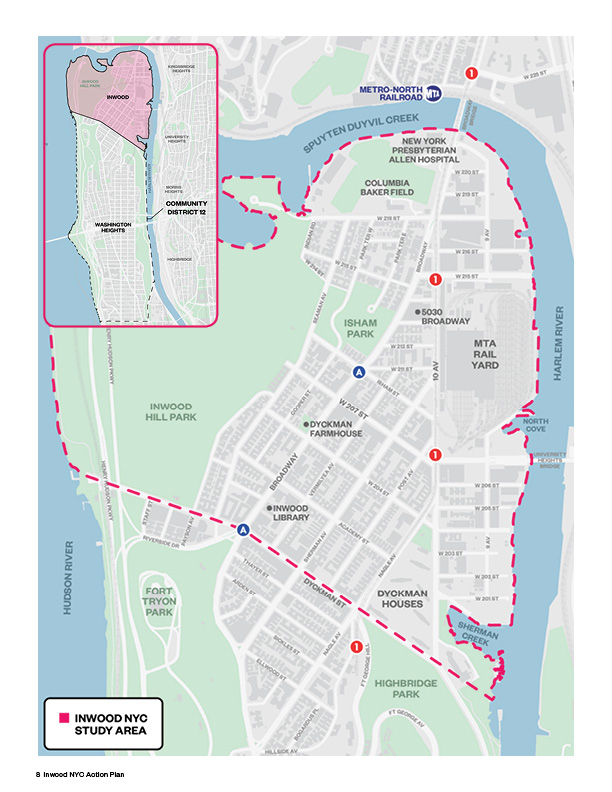 A coalition of community members called Uptown United—which includes Northern Manhattan Is Not For Sale, the Met Council on Housing, faith-based and progressive groups, and others—have put forward an alternate, community-driven rezoning plan called the “Uptown United Plan” that is a more ambitious and just vision for a future Inwood. This plan includes proposals for 100% affordable housing alongside demands for a deeper preservation of the character of the neighborhood while addressing potential displacement, environmental, infrastructural, and other social justice concerns which are not adequately addressed in the city’s proposal. Significantly, this coalition has built a movement among residents to testify and push back against the city’s plan. At one recent community board hearing, over 600 residents attended and expressed their concerns with the EDC plan and urged the board to adopt the Uptown United platform. Only a small handful of attendees, who were mostly representatives of developers and the EDC, spoke in favor of the city’s plan. The EDC’s rezoning plan entered the Uniform Land Use Review Procedure (ULURP) in January of this year, and is about two thirds of the way through this process at present. Within the procedure, a multi-phase review that determines if a rezoning can move forward, current and would-be community stakeholders are invited to give testimony for or against the proposal to city officials at different levels. Through their grassroots organizing effort, the Uptown United coalition has managed to secure “No” votes from both the Community Board 12 and Borough President Gale Brewer. These votes are only advisory, however, and it is uncertain what the binding votes of the City Planning Commission and City Council will reveal in the coming weeks and months. The City Council will review and cast their final vote between mid-July and late August. No Alternative to For-profit Housing? Behind this process is a conflict of class interests. On the one hand, developers and bankers want to make as much money as possible from real estate investments, but on the other, working class residents are squeezed out of up-zoned neighborhoods by resulting rent hikes. Mayor de Blasio pretends to fairly mediate this conflict. While partially speaking to the needs of affordable housing, he has also taken substantial campaign contributions from developers and appointed Alicia Glen, a former Goldman Sachs executive, as his Deputy Mayor for Housing and Economic Development. Glen oversees the EDC and 20 other agencies responsible for shaping his housing policy. Despite claiming to represent both sides fairly, it is clear whose side de Blasio truly represents. While it is certainly true that New York’s industrial-era land use regulations need to be updated, the real question is: who stands to gain the most from the EDC’s proposed plan for Inwood—tenants or developers? Housing is a universal need, but a system based on maximizing profits at any cost cannot solve the problem of affordable housing availability. Unless even 51% of fully affordable housing is achieved, this system will continue to be weighted in favor of the influx of affluent residents in the changing landscape of New York’s economy that is increasingly dominated by big tech, finance, and media. Even 51% affordability may not be enough to tip the scales back in favor of working-class tenants given the outrageous levels of luxury development by big international and domestic capitalists whose investment properties oftentimes sit vacant year-round. Such consequences aren’t a bug of capitalism, they are a feature. To make matters worse, the state’s rent protection laws—originally passed under the pressure of housing movements in the past—have been eroded and filled with loopholes over the years that favor predatory landlordism. When a pro-developer “up-zoning” happens, landlords are incentivized to take advantage of these loopholes that erode the availability of affordable units and drive out residents. The “preferential rents” loophole allows landlords to suddenly increase rents to the “legal regulated rent,” established by the Rent Guidelines Board, upon lease renewal. These sudden rent hikes lead to evictions and homelessness, both of which are reaching record-setting highs in New York City (The New York Times has recently profiled the spike in evictions, and homelessness is at Great Depression-levels, with over 60,000 people and families in the municipal shelter system this year). With the tenants removed, the landlord can then institute a “vacancy bonus” that allows the legal regulated rent to be increased a further 20%, thus driving the units beyond the rent stabilization threshold into fully market-rate properties via the “rent deregulation” loophole. Given that Inwood contains one of the last remaining large stocks of rent-regulated units, it is certain that many landlords are drooling over the opportunity to flip their properties via these loopholes. Small businesses face similar pressures in such situations and, as is evident from previous rezonings, many will be replaced by bigger corporate chains that are unaffordable to local residents. The city has promised some degree of legal aid to assist residents and small businesses who are faced with such predatory landlords, but no effort is made to root the problem out at its source by closing these loopholes. With this rotten foundation of for-profit housing markets weighted toward the developers and landlords, de Blasio is actually right to say that 100% affordable housing is a pipe dream. Capitalism can’t provide for such an outcome. Thus we’re told there is no alternative to the market “solution.” But what if we built an entirely new foundation? As with the fight for a $15 minimum wage, which Socialist Alternative spearheaded in Seattle and has since spread to many other cities, we need to build movements from below that do not limit themselves to what the market finds acceptable. Such a movement should instead reject any top-down, undemocratic plans for rezonings that do not boldly challenge the inherent failure of capitalism to provide high quality, 100% truly affordable housing for everyone in need. The Uptown United movement in Inwood, thanks to the hard work of activists within the coalition like Northern Manhattan Is Not For Sale (with whom members of Socialist Alternative and the Democratic Socialists of America are active), does just that. Our strategy has been to build the broadest possible fight from within the community itself to draw a bold class-based line in favor of a just rezoning for the working class, largely Dominican residents who have made this community their home for decades yet who stand to lose the most from the EDC’s rezoning. Through this community outreach, hundreds of residents have become involved in the fight to testify and protest at public hearings for 100% truly affordable housing—an impressive start. The City Council’s final public hearing is scheduled for July 10 and our movement will need the maximum possible turnout to protest the EDC’s pro-developer plan. The fight has just begun, however, and we should be realistic about the need to continue the struggle even after the official public hearings within ULURP are complete. The power of big business is currently stronger than our movement within the district, which is why we must continue to build the power of tenants and working class communities to be prepared to fight again and again for our interests. We must build a massive movement, uniting all neighborhoods across New York to fight against the developer’s rezoning plans and for 100% truly affordable housing. Their strategy has been to deliberately atomize our struggles, but a city-wide movement for socialist housing policies that puts people before profits is necessary and the only way to win. Like Seattle, our movement in New York cannot rely on the supposed good will of local representatives, who are almost entirely establishment Democrats claiming to represent the interests of working-class New Yorkers while in actuality submitting to big business. Like City Councilwoman Kshama Sawant, our movement will need candidates who take no corporate money, only take the average wage of workers within their constituencies, support bold working-class demands without bowing before corporate interests, and understand that what can happen in City Hall depends entirely on the strength of the people’s movements outside of City Hall. Ultimately, as we tirelessly advocate, we need to build a new party of the 99% that breaks with the two corporate dominated parties of Wall Street. Such a powerful movement with principled fighters for working-class interests within City Hall could then realistically demand massive tax increases on Wall Street and big business to fund 100% affordable housing and to fix NYCHA. As an important next step, if we were able to take into public ownership the biggest banks and developers who dominate the housing sector, we could also secure a permanent resource for a democratic socialist plan to build public housing for all who need it. To win these victories we will need disruptive tactics of nonviolent, militant direct action like rent strikes, pickets, demonstrations, and occupations led by residents, community activists, and crucially a fighting labor movement with unions that link their struggles to the housing movement. We will also need to expand our forces to fight for the working class and most oppressed not only within the city but internationally, for widespread socialist policies and a program for a democratically planned economy that provides universally for people, not profit. Otherwise, as long as the power of big business remains, even important gains in worker and tenant rights will be swallowed up by inflation and eroded over time by the 1%. So while we struggle on the ground with the Uptown United activists in Inwood to demand a just rezoning for the 99%, so too do we also show the blueprints for an entirely new foundation for society. Socialists support every reform we can win to provide relief in this crisis. But we also ultimately fight for an alternative to for-profit housing altogether and strive to link our local fights to the international struggle for economic and social justice. As with all essential human needs, like health care and education, housing is a human right, and should not be a source of profit—period. What right do Wall Street, developers, and big business have to make profits off of essential human needs? Everyone deserves a high quality home as a fundamental right, and as we’ve argued, there’s no good reason why that isn’t possible, especially in one of the wealthiest cities in the world, if only we’ll fight for it. The following concrete steps are offered as a summary of our ideas on housing and in favor of a Rezoning for the 99%. No Pro-developer Rezoning! Build 100% truly affordable housing, not luxury condos. Strengthen the State Rent Laws! Close the preferential rent, vacancy bonus, and vacancy deregulation loopholes. Expand rent stabilization to cover all apartments in NYC. Tenants’ Self Defense! For the establishment of widespread tenants associations that will collectively defend one another against any predatory landlords who seek to profit from the rezoning. Community Control! All plans for neighborhood rezonings and development to be overseen entirely by democratic committees of workers, residents, and their representatives who are not tied to corporate politics. A Good Home for Everyone! We support using eminent domain to take into public ownership any unused or empty luxury condos to house the poor and homeless. Tax the Rich! For a massive public works program to build high-quality public housing, funded by major tax increases on Wall Street, big business, billionaire developers, and residential luxury properties over $1 million in value, to be built entirely with union labor.